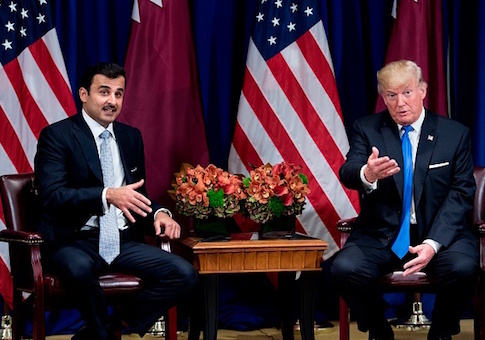 Trump administration allies and national security insiders have been voicing concerns about an upcoming meeting between President Trump and the Emir of Qatar, a chief terror financier in the region that has been clouded in controversy following disclosures it funded a spy operation on U.S. citizens and hacked the email of an administration ally, according to multiple sources who spoke to the Washington Free Beacon. Trump is scheduled to host Qatari Emir Tamim bin Hamad Al Thani at the White House on Tuesday amid on ongoing crisis between Doha and Gulf region nations who accuse the country of funding radical terror groups and aiding Iran's pursuit of regional dominance. The meeting between Trump and Al Thani is meant to serve as an opportunity to address the regional crisis. However, administration insiders have been pressuring Trump's team to address what they describe as the elephant in the room: Qatar's ongoing financing of terror groups and its recent state-funded spy operation on pro-Israel Jews in Washington, D.C.
Another issue that is likely to complicate the meetings is the recent hack of Elliott Broidy, a prominent Republican fundraiser and philanthropist who claims the Qatari government hacked his emails in a bid to damage his relationship with rival United Arab Emirates. Sources with knowledge of the upcoming powwow told the Free Beacon that Qatar's growing alliance with Iran threatens regional stability at a time when the Trump administration is working to counter the Islamic Republic's military intervention in Syria, Yemen, and a host of other countries. "Over the past year, Qatar has deepened its alliance with Iran, hacked the emails of a close friend of President Trump, continued supporting Hamas and the Muslim Brotherhood, and used its Al Jazeera network to run a spying operation against pro-Israel organizations on U.S. soil," said one veteran foreign policy adviser with ties to the White House. "These are not the actions of a responsible partner and ally. I don't understand how a government that turns a blind eye to terrorism while simultaneously using its state-run media apparatus to undermine the president gets an Oval Office meeting." The White House has been relatively mum about the Tuesday meeting, only telling the press, "The President looks forward to discussing ways to strengthen ties between the United States and Qatar and to advance our common security and economic priorities." Officials on the White House National Security Council did not respond to requests for comment on whether Trump will address Qatar's terror financing or recent hack attacks on U.S. citizens. Richard Goldberg, a former senior congressional official and current adviser to the Foundation for Defense of Democracies, told the Free Beacon that Trump must have a frank conversation with the Qatari emir or risk further inflaming regional tensions. "In addition to demanding further progress on terror finance prevention and curbing Al Jazeera incitement, President Trump needs to lay down the law on Iran," Goldberg said. "If the president is going to exit the JCPOA [Iranian nuclear deal] and bring back America's toughest sanctions, Qatar needs to choose a side—and it better not be Iran's." Tensions between Qatar and the United States have been growing for some time, but were amplified earlier this year when it came to light that the country's state-funded press organ, Al Jazeera, had conducted a secret, months-long spy operation of Jewish and pro-Israel advocates based in Washington, D.C. The network's activities have spurred a congressional investigation into Al Jazeera and calls for the press outlet to be forced to register as a foreign agent under U.S. laws. The Broidy hack further exposed a rift in U.S.-Qatar relations. Broidy's legal representatives recently informed Qatar that they have uncovered forensic evidence tying the Qatari government to a massive hack on Broidy that led to a series of damaging stories in the U.S. press. A lawsuit has been filed. One veteran congressional foreign policy adviser who works closely on the Qatar issue said the upcoming Oval Office meeting should serve as a frank wake-up call to the emir. "President Trump and the Emir are going to have a lot to talk about, and the Qataris are going to hear the same thing on the Hill they'll hear in the White House," said the source, who was not authorized to speak on record. "They've been taking an enormous number of liberties with American interests and American citizens. Over there they're boosting Iran even though the Iranians are waging wars across the Middle East. Over here they're spying and hacking American citizens and running info ops. That's not the way friends act." The pro-Israel community also will be closely monitoring the upcoming White House powwow. Ron Halber, executive director of the D.C.-based Jewish Community Relations Center, a pro-Israel community organization, said Qatar must be forced to prove its loyalty to the U.S. alliance beyond mere words. As a longstanding ally and funder of the terror group Hamas, Qatar is in a position to help rein in the group's ongoing terror activities, which includes a recent effort to swarm the Israeli border with militants in a bid to spark armed conflict. "With Michael Pompeo and John Bolton joining the administration the White House meeting is certainly happening under difficult circumstances for Qatar, to say the least," Halber said. "The Qatari emir will have to decide if he wants to try to be a true ally of the United States or continue to support Hamas and its murderous terrorism—he can't do both." "In the meantime, as the Emir visits the White House, the Trump administration should use its extraordinary leverage to insist that Qatar uses its influence with Hamas to, at a minimum, secure the immediate and unconditional return of the remains of Israeli soldiers for proper burial," Halber said. This entry was posted in National Security and tagged Donald Trump, Qatar, Trump Administration. Bookmark the permalink.